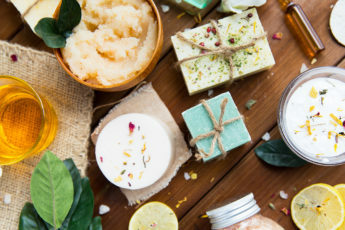 Natural hair care products can be found in anybody’s kitchen, letting every fashioniser get glossy, healthy hair without opting for expensive hair care products, which may contain harmful chemical ingredients. After all, some centuries ago, when there didn’t exist cosmetic products, women still managed to look beautiful and have well-groomed hair. Still want to know the advantages of natural hair care products? It’s easy to make DIY natural hair care masks at home, you don’t spend much money on them, besides you are 100% sure what you put on your hair and what result you’ll have. Below, we bring some wonderful natural hair care products that will help you get glossy, healthy hair at low cost! Turns out mayonnaise not only is an essential product for preparing delicious salads, but also an inexpensive ingredient for hair care. Although this may sound a little crazy, but mayonnaise is the most effective hair nourishing product. It contains amino acids and antioxidants, which have reinforcing properties for hair. Mayonnaise hair treatment is ideal for dry and damaged hair. How to Do a Mayonnaise Hair Treatment: Apply a little mayonnaise on your dry hair exactly the way that you apply hair conditioner. Cover your hair with a plastic shower cap and wait for 20 minutes. Afterwards, rinse the mayonnaise off and wash your hair with shampoo. This fermented apple juice has incredible smoothening properties for hair, but also thoroughly cleanses skin and whitens teeth. Cider works as a natural lotion for hair and is definitely more efficient than any product bought at the drugstore. How to Do a Cider Hair Treatment: Take equal amount of cider and water and mix both the ingredients. After shampooing your hair, apply the mixture and gently massage the hair. Leave it on for a few minutes and then rinse it off with water. Don’t use conditioner afterwards. Cider will make your hair softer and smoother. The hair care benefits of beer aren’t a surprise for you, indeed. It strengthens hair and adds shine to it. How to Do a Beer Hair Treatment: After washing your hair with a shampoo, apply some beer (at room temperature) and massage your head for a few minutes. Wash it off with water. The best natural hair care product to treat hair loss is definitely black tea, which also adds shine to your hair. The caffeine contained in the tea works like magic. If you have light hair color, you’d better not use this product, since black tea tends to darken your hair color. How to Do a Back Tea Hair Treatment: Brew 2-4 bags of black tea in half a liter of hot water. Let the mixture rest for a few hours. Pour the mixture over your head after washing it and apply a plastic shower cap. After 20-30 minutes, rinse it off and apply a hair conditioner. Avocado contains fats that hydrate and nourish hair, making it soft and silky. In its turn, olive oil has brightening properties; so together these two products do wonders. How to Do an Avocado and Olive Oil Hair Treatment: Peel one ripe avocado and squeeze it. Mix the avocado juice with 2 tablespoons of olive oil in a small bowl. Apply the natural hair mask on damp hair and put on a plastic shower cap. After 20 minutes, wash your hair. Always having these natural hair care products in your kitchen, you can be sure to get super-glossy and healthy hair soon without visiting a doctor or beautician and spending much money on expensive hair products!